Update 28 February 2014—Caution: The claim by paleontologist Arturo Vildozola, referred to in this article, that the entities he found were ‘giant oysters’, has not been verified. Many thanks to our correspondents for alerting us to this—see Shelly sham below. Whether or not you think of oysters as a gourmet delicacy, there’s something	about these fossilized giant oysters that attracts attention. Eye-catching not just	for their size—some measure up to 3.5 m (12 ft) across and weigh 300 kg (650	lb)—but also for where they were found … high in the Andes Mountains! About 500 of these gigantic fossilized oysters were discovered 4,000 m (13,000 ft)	above sea level in Huancavelica province, approximately 400 km (250 miles) south-east	of Peru’s capital city, Lima.1,2 But how could oysters have ever lived up there? For paleontologist Arturo Vildozola (photographed with oysters), the find demonstrates	that the Andes mountains were once under water. So does this mean that he and other	scientists believe the Biblical account of the worldwide Flood of Noah’s day,	around 4,300 years ago? No, for according to their theory, based on evolutionary timescales, these oysters	hail from the early Jurassic period, 200 million years ago. Geologists believe that	since that time, the Andes have been slowly uplifted from the ocean, as a plate	under the Pacific Ocean collided with the South American plate, forcing the latter	upwards. But this long-age scenario of slow uplift faces a major current problem. Rates of	erosion are greater than uplift rates, so uplift cannot keep pace with erosion3—i.e. the Andes (4,000 m above	sea level) would erode within 56 million years. Yet evolutionists claim that these	oysters atop the Andes date from 200 million years ago! Put simply, the stark conundrum	is that if the Andes really were that old, they would no longer be here. And this long-age conundrum is not confined to the Andes. All over the world, fossils	of marine organisms can be found in rock layers in high mountains. But evolutionary	dating puts the age of these mountain rock layers far beyond their ‘erode-by’	date—clearly not reconcilable with reality. In contrast, the Biblical account of the worldwide Flood not only explains why so	many marine creatures came to be buried in layers of sediment, but also how these	layers came to be lifted to high altitude. Psalm 104 describes how the Flood ended	when ‘The mountains rose up; the valleys sank down’,4 and the waters flowed off the uplifted	land into the new ocean basins. The whole process did not take millions of years,	but occurred rapidly, marking the end of the Flood, around a mere 4,300 years ago. Real fossil oysters collected by Mats Molen in Los Osos, California, near San Luis Obispo. Could it be that the internationally published news reports describing these as ‘oysters’, based on first-hand assessment by Arturo Vildozola, described as a paleontologist (‘presi­dente de la Sociedad Andina de Paleontologí­a’), were wrong? When we checked the Web for any further developments, we found that the news reports had prompted debate at , where some contributors echoed Mats’s perspective, i.e. the rocks are concretions rather than fossil oysters. Hopefully other paleontologists will be spurred by this to check Vildozola’s contention first-hand. Though we would not want to have described concretions (should that turn out to be the case) as oysters, the conclusion of our article remains valid—i.e. that marine-deposited sediments at high altitudes fit with Biblical history. 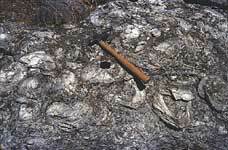 We thank Mats Molen for sending the above two photos of undisputed fossil oysters that he (along with well-known American creationist Dr Gary Parker, and others) observed on some 200 m (600 ft)-high hills on the Californian coast. The Cairns Post, 3 March 2001, p. 24. Return to text. Sunday Herald Sun, 11 March 2001, p. 40. Return to text. See: Walker, T., Eroding Ages, Creation22(2):18–21, 2000. Return to text. See: Taylor, C.V., Did the mountains really rise according to Psalm 104:8?, CEN Tech. J., 12(3):312–313, 1998. Return to text. Oysters have the unfortunate distinction that they were one of the first examples	of an alleged proof of evolutionary lineage in the fossil record (mooted by paleontologist	A.E. Trueman in 1922).1 The ‘flat’	oyster, Ostrea sp., was said to have evolved into the coiled shell Gryphaea	sp. Several generations of science students were taught this as ‘one	of the best documented cases of evolution’ in the fossil record. However, today it seems that coiling is a built-in programming response to the environment,	i.e. 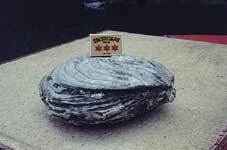 mud-sticking oysters grow into a coiled cup-shaped form, while oysters attaching	to firmer substrate2 grow to be	‘flat, fan-shaped recliners’. 3	So, coiling is an individual growth response to local environment; not a millions-of-years	evolutionary twist. Instead of trusting man’s changing theories, heralded as ‘fact’	today but discarded tomorrow, we can rely on the absolute truth of the unchanging	Word of God. 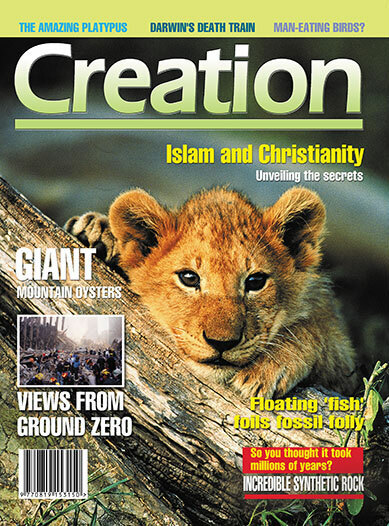 Palaeo-Comment 38, , 30 November 2001. Return to text. For the first days of their life, young oysters swim freely, but then attach themselves permanently to a site. (They obtain their food—minute organic particles—by filtering the water.) Return to text. Machalski, M., Oyster life positions and shell beds from the Upper Jurassic of Poland, Acta palaeontologica Polonica43(4):609–634, 1998. Abstract downloaded from , 30 November 2001. Return to text. Ager, D.V., The nature of the fossil record, Proceedings of the Geologists’ Association, 87(2):131–160, 1976. Return to text. Oysters are bivalve mollusks found in coastal waters of all oceans.1 The two valves of each shell are hinged together by an elastic ligament, with a large central muscle serving to close the valve against the pull of the ligament. The fact that the fossilized oysters of the Andes (main article) are closed suggests they were buried alive. Ordinarily, when the central muscle relaxes after death, the ligament pulls the shells open—but in this case the weight of overlying sediment (evidence of Flood deposit) prevented this. Pearls form in oysters when nacre (the same material as that lining the oyster shell—also known as ‘mother-of-pearl’) accumulates around a piece of foreign matter lodged inside the shell. The discovery that pearls could be cultivated by artificially introducing a foreign body was apparently made in 13th-century China. Cultured pearls are harvested mostly from oysters over five years old. The general information about oysters presented here is based on Encyclopedia Britannica, 15th edition, 3:785; 9:37, 226, 1992. Return to text. One possible explanation is that selection pressure from expanding post-Babel human populations hunting food has favoured survival of smaller individuals of targeted species. (This is not evolution because the genes for small size already existed—no new information was generated.) Fisheries surveys bear this out—the trend over recent decades is for fish to mature at a smaller size as a result of fishermen selectively removing larger fish. Return to text. Other examples of pre-Flood giantism include penguins, snakes, insects, emus, wombats and kangaroos: see Creation 5(1):5, 1982; 7(1):4, 1984; 12(4):25, 1990; Kangaroos: God’ amazing craftsmanship, Creation 20(3):30–31, 1998. Return to text.